This Oreo Insanity Cake is a diet busting, sugar rush inducing, chocolate overdose, piece of heaven. 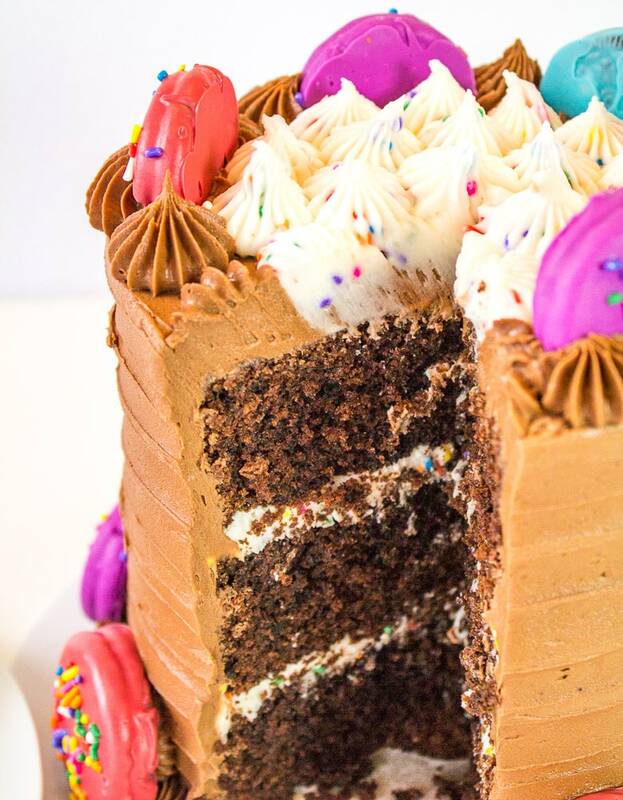 There is so much going on in this cake, it’s insane, but seriously good. Ok let’s talk about what’s in it. 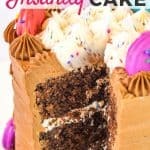 The actual cake is a rich chocolate cake with chopped oreos added to the batter. 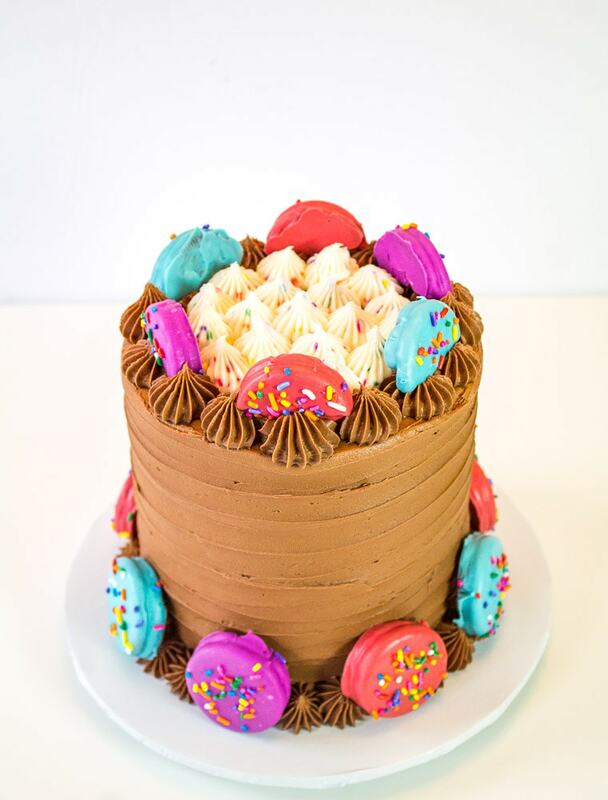 Once baked, you’ll fill it with funfetti marshmallow buttercream. Fun, right? Okay, so you can skip the sprinkles if you want, but I think it adds a little fun to it. 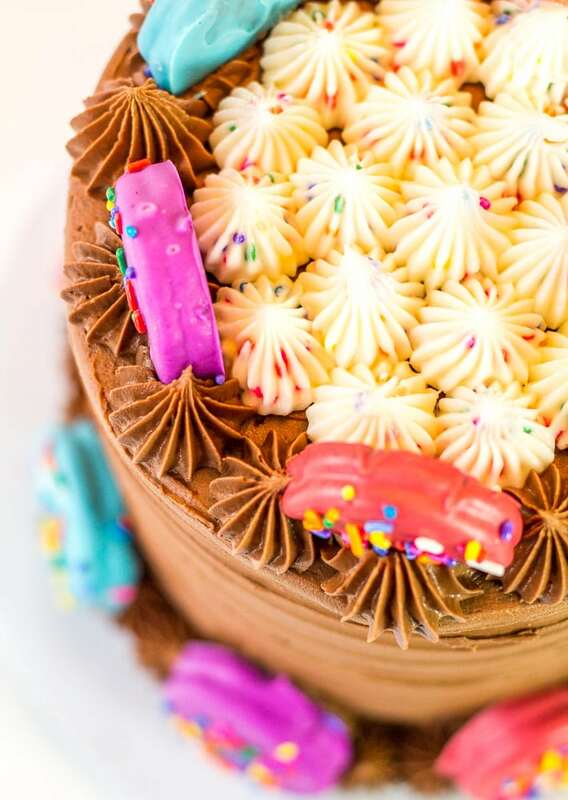 Next it’s covered with double chocolate buttercream…And as if that’s not enough, you’ve got oreos dipped in brightly colored candy melts, then attached to the cake with buttercream. Yep this one’s totally diet busting, but oh so worth it. 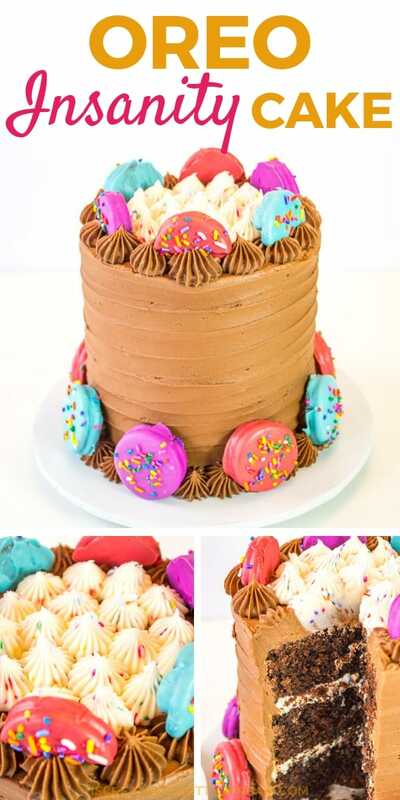 You really don’t even need a special occasion to make this…just a massive sweet tooth (which I seem to have at all times). Okay let’s get to the recipe. Oh, and there’s a video below as well that will show how everything is put together. 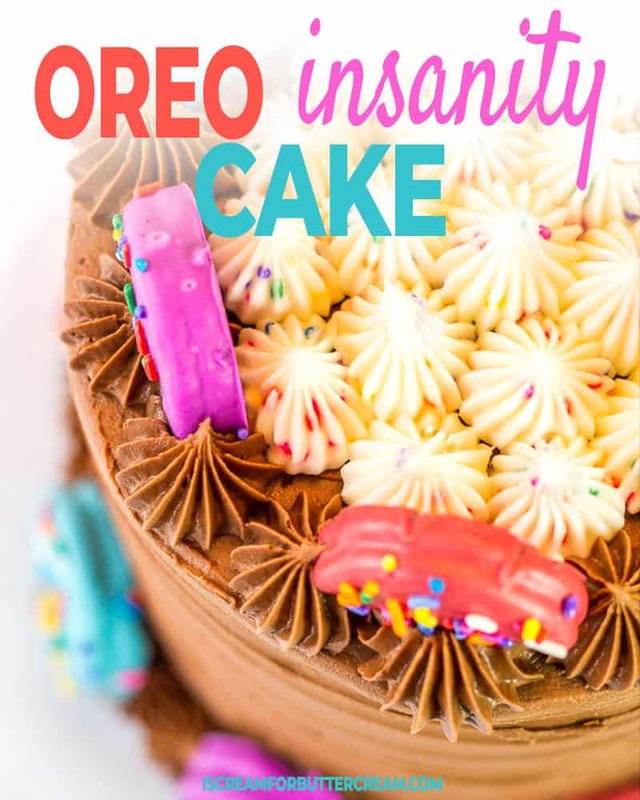 This Oreo Insanity Cake is a diet busting, sugar rush inducing, chocolate overdose, piece of heaven. 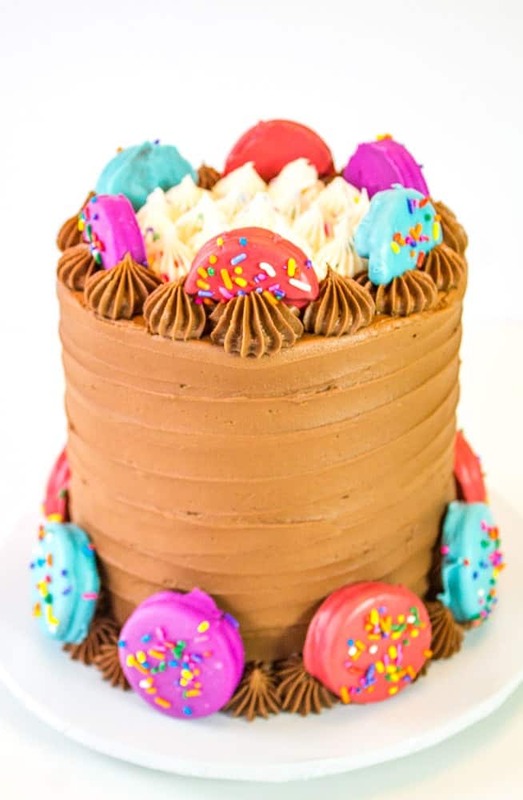 The actual cake is a rich chocolate cake with chopped oreos added to the batter, filled with funfetti marshmallow buttercream, then covered with double chocolate buttercream and oreos dipped in colorful candy melts. Preheat the oven to 350 degrees. Grease and flour three 6 inch pans. Chop almost an entire package of oreos. A food processor makes it easy, but you can also add them to a ziplock bag and hit them with a rolling pin to crush them up. Set these aside for later. Also save about 10-12 whole oreos for decorating the cake. In a mixing bowl, add the flour, cocoa powder, sugar, baking powder, baking soda and salt and mix. In a separate bowl, mix together the eggs, milk, oil and vanilla extract. Add the liquid mixture to the dry mixture and mix until combined. Add in the hot water and mix. Add in two cups of chopped oreos and mix again. Scrape down the sides of the bowl and mix again just until well combined. Be careful not to overmix. Pour into three 6" round cake pans and bake at 350 degrees for about 50 minutes. Cool on a wire rack for ten minutes. Turn out of pans and cool completely on wire rack. Mix the butter until smooth. Add in the marshamallow cream and mix well. Add in about three cups of the powdered sugar and a couple tablespoons of milk. Mix well. Add in another cup or two of powdered sugar. (It'll be sweeter and thicker if you add in the extra cup.) Add in milk by tablespoon as needed if your buttercream is too thick and add in the vanilla extract. Mix well. Add in sprinkles and mix with a spoon or rubber spatula. Mix the butter and cocoa powder until well combined. Add three cups of powdered sugar and a couple of tablespoons of milk. Mix well. Add in the other three cups of powdered sugar and a tablespoon or two of the milk and mix well. If it's too thick, add in another tablespoon of milk and mix. Add in the melted and cooled chocolate and mix well. Melt the candy melts in the microwave. It's helpful to add in a teaspoon of vegetable oil to thin them out a bit. I used pink, purple and turquoise, Dunk the oreos into the melted candy melts, sprinkle with sprinkles and let set up on wax paper. 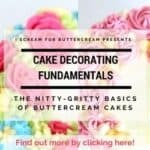 Lay a cake layer on a cake plate or board. 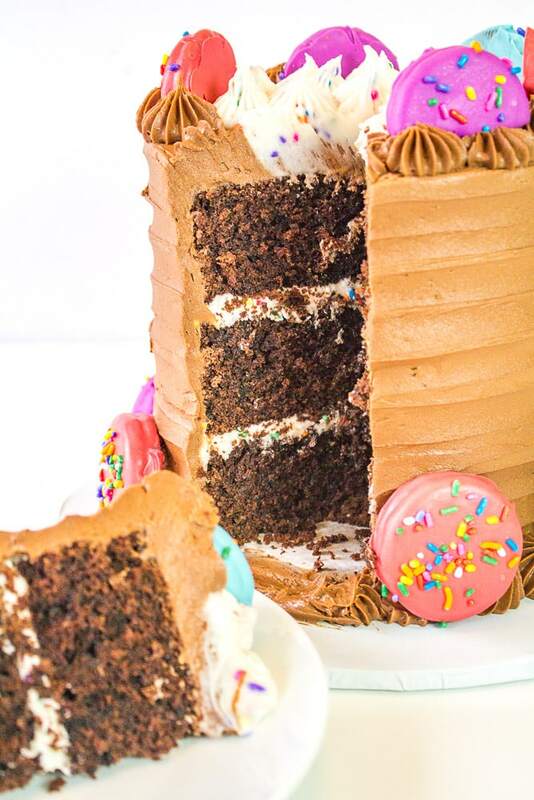 Add the funfetti marshmallow buttercream and then top with another layer of chocolate cake. 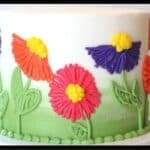 Add a layer of the marshmallow buttercream and then top it off with the third layer of cake. 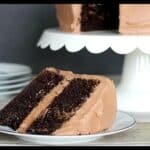 Cover the entire cake in double chocolate buttercream. 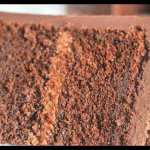 Pipe a border around the top and bottom of the cake. 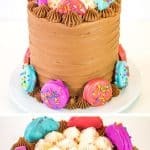 Now pipe dollups of the funfetti marshmallow buttercream on top of the cake inside the chocolate border you just piped. 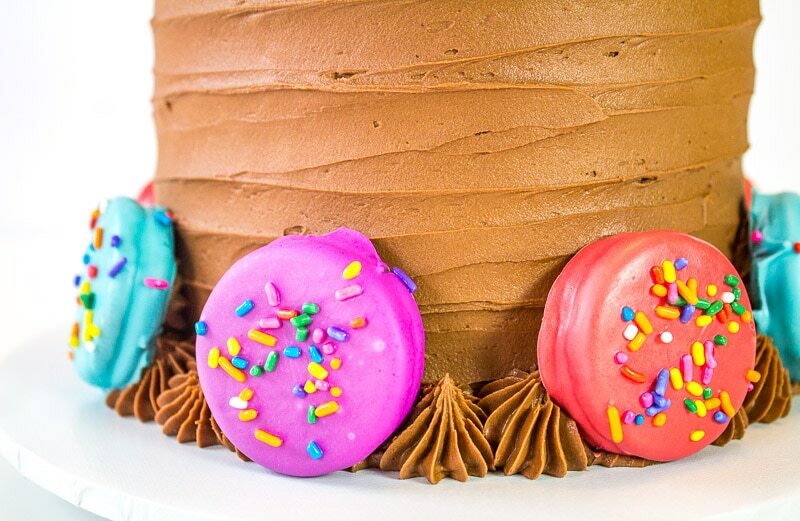 Attach the candy dipped oreos around the bottom of your cake with a bit of buttercream. Break several oreos in half and set them around the top of your cake. 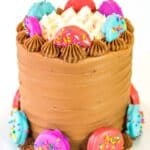 What a fun cake to make for a birthday celebration, right! Add a scoop of ice cream and you’ll be in heaven. You may need a nap afterwards and possibly some insulin, but hey, you’ll be happy!